Learn about the beginnings of the 1000 Flags/1000 Waters project from NRDC's OnEarth Magazine. 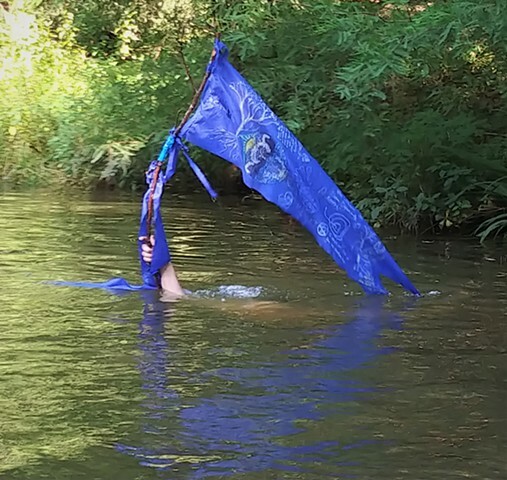 The blue banner seen above is part of 1000 Flags/1000 Waters—a project initiated by NRDC Artist-in-Residence, Jenny Kendler, and directed by ARTivist Mara Robbins——which takes the form of a series of Water Flags, aiming to empower and unite frontline communities and water protectors engaged in resistance against the fossil fuel industry. Each Water Flag is a blue, fluttering banner—suggesting a stream of clean, free-flowing water. The project creates and shares pre-made flags and easy DIY instructions, aiming to be responsive to the need to move quickly against well-funded fossil fuel corporations and the governmental bodies who may support them. Rather than a top-down or single-author artwork, 1000 Flags/1000 Waters is a framework to mobilize and empower communities on the ground—supporting, honoring and amplifying the existing work of frontline water protectors. After visiting family members in her home state of Virginia, involved in both advocacy and direct resistance against the pipeline, Kendler began to consider how art could be a part of this multi-pronged and many-voiced movement. The project grew quickly in the wake of the urgent need to act quickly against the MVP pipeline construction. Taking its name from two NRDC reports which identified that the disastrous proposed Atlantic Coast Pipeline (ACP) and Mountain Valley Pipeline (MVP) will cross Virginian waterways over 1000 times, the project aims to visually and viscerally represent this staggering number by creating at least 1000 Water Flags—a feat which has nearly been accomplished, thanks to widespread community enthusiasm and the tireless efforts of Mara and support of Kay. 1000 Flags/1000 Waters continues to support activists and water protectors, who may choose to use these flags to celebrate, mourn, show solidarity or to converge—continuing the important work to rapidly move our culture towards water justice, away from fossil fuels and into a clean energy future that benefits everyone.